Nova is a software produced by Anodyne, built specifically for role playing and simming. A wide variety of game styles are possible with Nova, and it is fairly easy to learn. 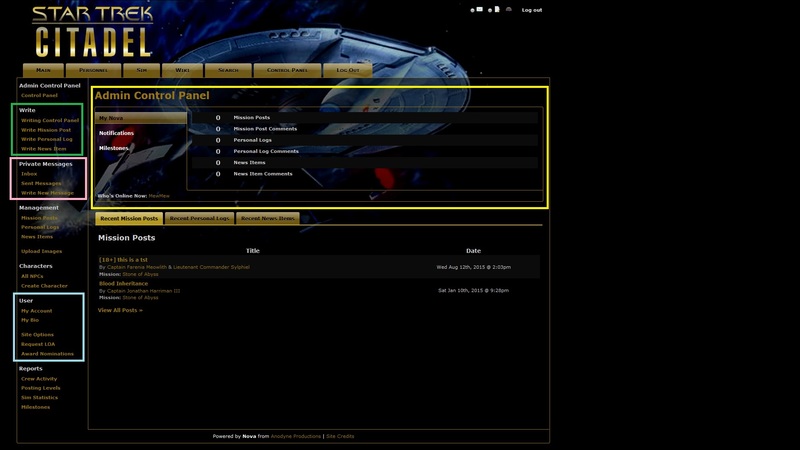 Anodyne originally developed the Simm Management System (SMS) for Star Trek role playing simulations in 2005. The first release of Nova was in 2010 with Nova 1. The current version available for release via the Anodyne website is Nova 2.4, with Nova NextGen currently in production. However, most of the simulations in the Alliance use version 2.3.2-AZ1 (which was modified by Webmistress Azmaria). Like the original SMS, Nova takes the clutter that form-based simulations often generate and eliminates it. Where before a story topic became unwieldy with unwanted interruptions, stories can now be told in compact “joint posts” in which only the writers who have been added as authors are able to write. There is, of course, a trade off in that Nova sends you emails every time a post is updated (but you can turn that off if you want). 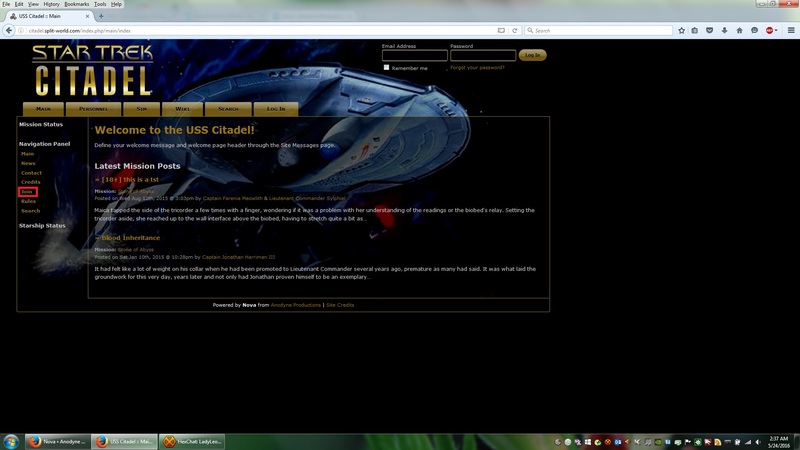 There are two ways to join a Nova simulation: from the main page and from the personnel manifest. If joining from the main page, look for a link on the side that says “Join.” It may be on either side of the page, depending on the simulation's installed theme. On the Citadel, our example shown here, the link is on the left. To join from the personnel manifest, click that tab on the top of the page that says “Personnel.” The page that opens will show you who is currently assigned to the simulation. To see the open positions, look for the line that says “Show” and then click “Open Positions.” From there you can pick a position to apply for. Both of these options will take you to the “Joining Disclaimer” page. Read whatever the game managers have written there and click “Agree.” Please note that by clicking the “Agree” button, you are agreeing to all of the rules listed on the disclaimer page as well as the rules posted elsewhere. Make yourself familiar with them before joining because you'll be expected to follow them whether you've read them or not. Regardless of which option you choose for registration, both will bring you to the application form. The only difference is if you go through the manifest, the position will be filled in for you. 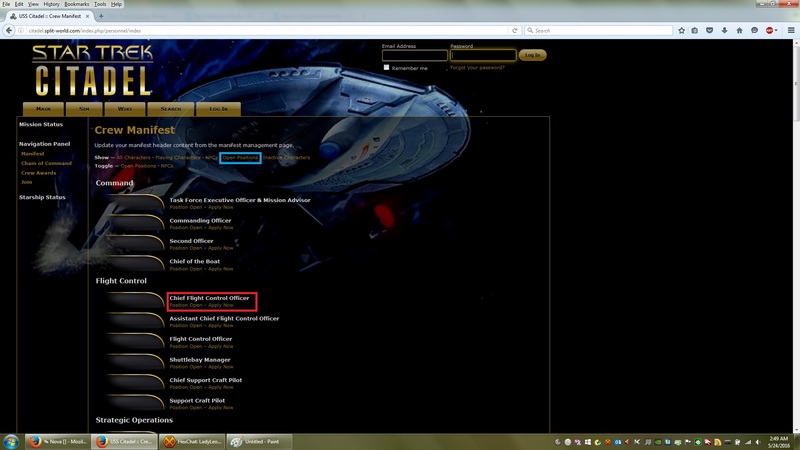 We have already detailed how to fill out the biography form on the Character Creation page. Please note that your name and your character name should generally not be the same, in the interest of internet safety. You will need a valid, active email address in order to receive updates from Nova. The user control panel is where you'll find options to do anything you could possibly need to do once you've been accepted. Here, we are only showing you the “power user” control panel, which is what you will most likely be using. The game managers have a slightly different panel, which allows them control over game settings and other management necessities. Each piece of the panel has been assigned a color, to help you orient to it if this is your first time using Nova. The Admin Control Panel, surrounded by a yellow box, is where you'll see notifications, milestones, and your personal contributions. This is where you'll see if you have any messages or posts that have new replies (however, most nova simulations have the bubbles seen at the top as well). The Write controls, surrounded by a green box, are where you start a new post, personal log, or news item. 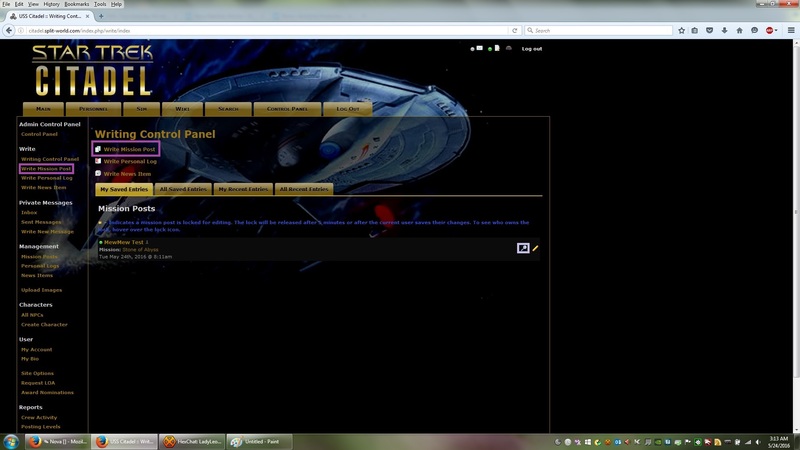 There is also a link to the Writing Control Panel, where all of your posts-in-progress will be listed. Private Messages, surrounded by a pink box, has links to your inbox and sent items, as well as a link for sending a new message to someone. User, surrounded by a light blue box, has links for updating your profile, site options, requesting a leave of absence, and nominating people for awards. The Writing Control Panel is where you'll find your saved posts and recently published posts. Some simulations also have a modification that allows you to read all saved posts. There are options for both reading and editing your saved posts. To read a post without locking it for editing, click the magnifying glass (shown below in a light purple box). To edit, click either the title of the post or the pencil (both shown below in hot pink boxes). Please do not lock a post for editing unless you are editing it. Similarly, do not save a post unless you have added something to it. Please note that a post that has new replies is denoted by a green bubble next to its title. Posts that do not have new replies will not have a bubble at all, and posts that have been locked for editing will have a little gold padlock. You'll also find that if you have posts with new replies, the bubble in the top right corner of the screen will be green. If all your posts are updated, it will be yellow. If you have no posts in progress, it will be grey (get a post started!). Writing posts in Nova is easy, but it can be intimidating if your only background comes from forum-based simulations. Fortunately in this regard, Nova is fairly user-friendly. Generally speaking, learning to write a post usually takes a short period of time. There are two ways to start a new post. You can click on “Write Mission Post” at any time in the control panel, and the link is also available (in larger font) inside the writing control panel. Both are shown below in purple boxes. Either of the links will open the writing screen, which has several parts to it. Authors (red box) - this is where you decide who is involved in your post. Click in the box to produce a list to choose from (once you've clicked in it, you can begin typing to find a name). Your characters will always be listed first, followed by other player characters and then non-player characters. You can write a post with as few or as many people as you wish. 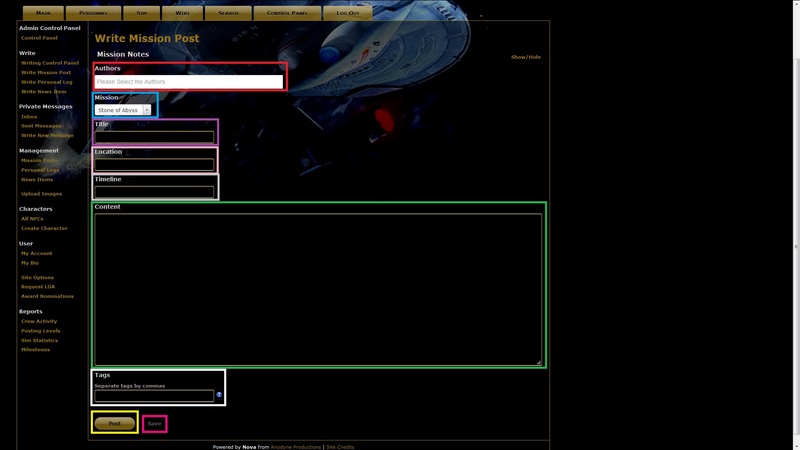 Mission (blue box) - this is a drop-down box that shows the available missions to place your post in. Generally most simulations have a current mission and an out-of-character mission. Title (purple box) - name the thing! You can do this last, after the post is written. But all posts need a title of some sort. Location (pink box) - wherever the post is taking place. Timeline (grey box) - this part can be tricky. Some simulations require an exact time while others are okay with saying it comes before or after another post. Use your simulation's guidelines for that. Content (green box) - where the body of your post is written. This box accepts HTML for styling, but we'll cover that on another page. If you want to tag someone to write next, do it in the content box. Tags - (white box) this is not where you tag people to write. This is for metatags, which are used to search for your post. Don't put anything here unless your game managers tell you to because it's pretty much unnecessary. Save button (hot pink box) - saves the post so others can write to it. Nova is a good system for managing simulations, but it still has some problems. You may encounter some of these from time to time. The Saved Post Bug - Sometimes when you save a new post, the page will refresh and it won't look like the post saved at all. What's happening here is that Nova has saved the post and then re-opened it for editing. If you hit save again, you'll have two copies of it. Go to your writing control panel, and the post will be there. We promise. Now to unlock it so others can post, click the title. It will start to open and then the panel will refresh, with the post now unlocked. This only happens when starting a new post. The “You Do Not Have a Character” Bug - Thankfully, this doesn't appear very often. However, when it does appear it can be quite distressing. Here is the scenario: you log into Nova and your “posts” bubble at the top of the page is grey, even though you know you have posts saved. When you click that mysteriously grey bubble it tells you that you don't have any characters associated with your account. Do not panic. Log out and back in and it'll be fixed.